Group of people wich want to improve savety and comfort for the bicycle riding community. The group takes care of all interests bicycle riders have. Especially the communication to the city administration and the planning offices for public transport and traffic developement. The city of Cologne is crowded, people move by car and public transport. There’s pollution and less savety for little children and people gets more and more motionless. One answer to this problem is bicycle traffic. At the moment 550.000 bicycles are on the streets of Cologne. But teres only less care about them. For example no one cares about the rotton bikes or broken bike paths. The city of Cologne takes care for the main parts of the city, but not for the outkirts like Mühlheim. The government is not so interested, because the policy for bicycles is not so important. The solution came to live in 2002. The aim of MFG Farhrradgruppe is to optimize bicycle traffic. They manage only the Cologne’s district Mühlheim. MFG gets one or two phonecalls a week. People complain about broken bike paths, rotton bikes standing around etc.Thats more than they can handle. The response from local people is good. In the district Mühlheim are living 143.000 people. In fact the city of Cologne is responsible to take the litter away (rotton bikes) and service the bike paths, but they don’t like it, so they dont’t recognise the problem because it costs money. They take care for the main parts of the city, but not for the outskirts like Mühlheim. Like the ADFC they work together with the bicycle commisioner of the city hall. But the ADFC don’t handle little problems, they can’t act at the bottom. The MFG has more room forr manoeuvre, because they are a smaller organisation than the ADFC. The MFG is not a member of the ADFC, but ADFC and VCD joined to MFG union. So they have a broad spectrum of influences.The work with politicians is good. The government is not so friendly, because the policy for bicycles is not so important. The less than ten members of MFG have one meeting a month. They talk about handling and to-dos. The main time they go out and inspect the bicycle ways. They don’t offer freetime actions because they cannot compete with the ADFC, but they link to the offer of the ADFC on their website. 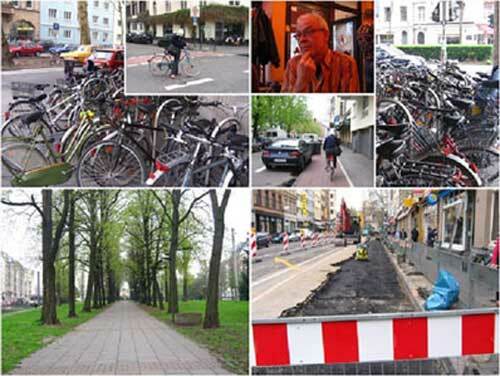 There’s an online forum people can discuss complain about the bicycle culture in Cologne on the MFG’s website. The Solution is viable since 2002. The solution is a service idea based on the concepts of other organisations that are interested in environment and bicycle: ADFC, VCD and BUND. Like the ADFC they work togehther with the bicycle commisioner of the city hall. But the ADFC don’t handle little problems, they can’t act at the bottom. The MFG has more room forr manoeuvre, because they are a smaller organisation than the ADFC. The MFG is not a member of the ADFC, but ADFC and VCD joined to MFG union. So they have a broad spectrum of influences. The solution could be spread out of Cologne. The IFMA asked MFG to take part in the Cologne’s bicycle trade fair. Thats a great honest, but itt’s not the right place to get in contact with local people. As often as possible they contact the local press to have articles about MFG in the local news. The solution works since 2002. In the small area they are responsible for, they work very well. The response from local people is good and as often as possible MFG contacts the local press to have articles about their projects in the local news. MFG gets one or two phonecalls a week and that’s more than they can handle. They work together with the bicycle commisioner of the city hall and handle little problems bigger units like the ADFC are not responsible for. So the MFG is able to act at the bottom and has more room for manoeuvre. The members of the MFG work honorary. They spend a lot of time in the organisation. The sponsorship union collects money. Additionally there are returns from advertising of local bicycle dealers on the webseite of MFG. People complain about broken bike paths, rotton bikes standing around etc. They don’t offer freetime actions because they cannot compete with the ADFC, but they link to the offer of the ADFC on their website. There’s an online forum people can discuss complain about the bicycle culture in Cologne on the MFG’s website. The city of Cologne is crowded, people move by car and public transport. There’s pollution and less savety for little children and people gets more and more motionless. One answer to this problem is bicycle traffic. At the moment 550.000 bicycles are on the streets of Cologne. But theres only less care about them. For example no one cares about the rotton bikes or broken bike paths. The city of Cologne takes care for the main parts of the city, but not for the outkirts like Mühlheim. The government is not so interested, because the policy for bicycles is not so important. The members of the MFG work honorary. They spend a lot of time in the organisation. The sponsorship union collects money. Additionally there are returns from advertising of local bicycle dealers on the webseite of MFG. The city hall of Cologne doesn’t care much about cyclists, so they dont’t spend much money for optimisation and servicing.